TURN UP THAT DIAL! 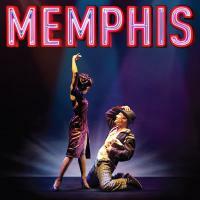 From the underground dance clubs of 1950s Memphis, Tennessee, by way of hit runs at the La Jolla Playhouse and Seattle’s 5th Avenue Theatre, comes a new Broadway musical – inspired by actual events – with heart, soul and energy to burn. He’s a young, white radio DJ named Huey Calhoun (Chad Kimball), whose love of music transcends race lines and airwaves. She’s a black singer named Felicia Farrell (Montego Glover), whose career is on the rise, but who can’t break out of segregated clubs. A theatrical event that combines Broadway splendor with the roots of rock, MEMPHIS features an original story by Joe DiPietro (I Love You, You’re Perfect, Now Change) who will be joined by MEMPHIS leads Montego Glover and Chad Kimball in The Greene Space for an intimate dialogue that takes you behind the scenes and goes to the heart of this Broadway work. Video excerpts of MEMPHIS will be folded into the dialogue. Moderator, Celeste Headlee, co-host of WNYC’s The Takeaway.